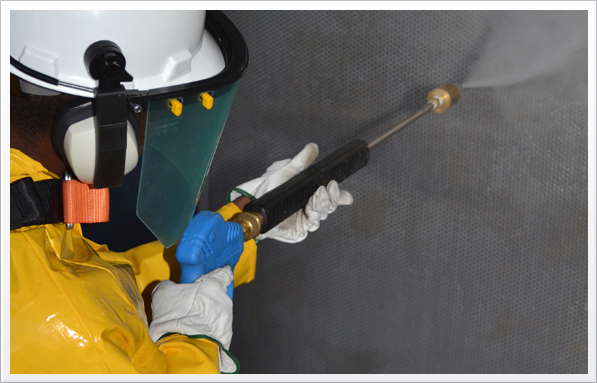 This technique, used for years by Five Star is the most advanced technology for cleaning and surface treatment, can be used in any type of anticorrosion maintenance, meeting all the health and safety requirements. Using pressures up to 45,000 psi. A long tradition service provided by Five Star, since the beginning of our company, executed with internationally recognized quality standards and excellent results measured by performance indicators in areas such as health, safety, environment, quality control and delivery. Five Star provides specific access engineering solutions to our projects. We work according to NR-18 regulations, using appropriate equipment and ppe’s, ensuring safe work conditions. Spider jet works in inclined, vertical and horizontal areas through a vacuum suction unit, which also removes all waste water and solids. Due to its high performance, automation, agility, quality, and hence bigger and better results. The equipment is owned by Five Star, which allows a quick mobilization, minimizing mobilization time for our customer.